Home > Blog > I Just Got Served with a Lawsuit. Now what? Being served with a lawsuit can be an overwhelming experience, especially if this is your first time being sued. You may not know where to turn or what to do in this situation. For this reason, we have developed a short list of things that you should do (and some things you should not do) soon after you have been sued. Here are five tips on how to best proceed after you have been served with a lawsuit. 1.Do not panic. There are roughly 15 million lawsuits filed in the United States every year, and not surprisingly, many of them fail in the early stages for one of many reasons, including: delay past the applicable statute of limitations, lack of jurisdiction, failure to state a proper claim upon which relief can be granted, or legal standing to sue. The lawsuit may not be as serious as it seems at first, but often the only way to gauge the lawsuit’s gravity is to consult with an experienced attorney. 2. Familiarize yourself with the litigation timeline. Once you have been served with the lawsuit (or “Complaint”), you have a short period of time in which to file a response (or “Answer”). In Arizona, you have only 20 days to hire an attorney, develop a legal strategy and craft a response to the lawsuit before the person who filed the lawsuit can apply for a default judgment. If the Court enters a default judgment, you will not be given the opportunity to refute any of the claims alleged against you in the Complaint, and the Court will likely subject you to the penalty requested by the opposing party. 3. Gather all the evidence. Locate and save all of the documents, photographs, and any other evidence you may have that could potentially be relevant to the lawsuit. Saving all the evidence early in the process, whether helpful or harmful to your defense, could save you a lot of time and money later on in the lawsuit. It is best to keep all of this information together in a central location. 4. Consider hiring an attorney. Navigating the court system can be difficult, and there are many procedural hurdles you must overcome to prevail in court. There are very few circumstances where you might be able to defend the lawsuit yourself, but before you decide to move forward without an attorney, you should consider the degree of risk involved in the lawsuit, the complexity of the legal issues, the amount of time you have to devote to the case, and your own expertise in the subject. Most of the time, it is in your best interest to hire an experienced Mesa litigation attorney who can provide a fresh perspective and help you through the stressful litigation process. At the very least, you should strongly consider having an initial consultation with an experienced attorney who can provide you with some initial guidance and assessment on the complexities of you case. It is not uncommon for people to initially try to defend themselves on their own, only to later hire an attorney after getting a few months into it. By then, they have often unknowingly missed deadlines or forfeited some defenses. 5. Evaluate your legal options and develop a litigation strategy. You may wish to file a countersuit against the person who sued you, or you may wish to settle the case before you incur the costs of litigation. In either case, you should have a clear idea of what your goals are for the litigation and communicate those goals clearly with your attorney. If your strategy involves going to trial, make sure that your calendar is free of any vacations and other obligations in the coming months so that you are available for depositions, meetings with your attorney, and all or most hearing and trial dates. 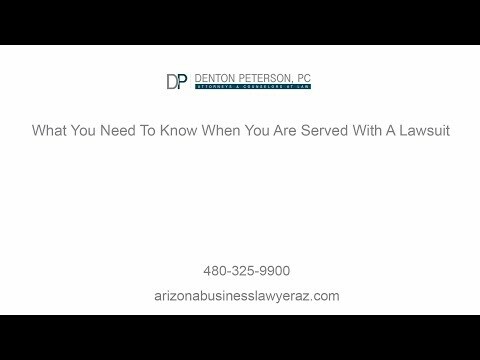 If you have been served with a lawsuit contact our experienced litigation team at Denton Peterson PC today. We are happy to help!